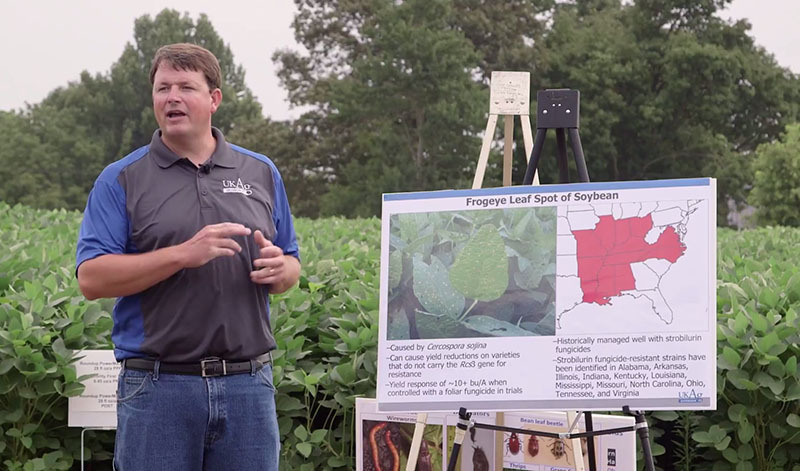 Carl Bradley gives a corn and soybean disease update to farmers during the UK Corn, Soybean, and Tobacco Field Day. Dr. Carl Bradley is a plant pathologist for the University of Kentucky. In his role, he studies diseases in field crops (corn, soybeans, and wheat), researches ways to manage those diseases, and then passes the information on to farmers across the commonwealth. While Carl is not originally from Kentucky, his family farmed just across the Ohio River in southeastern Illinois. He always had an interest in agriculture and science at a fairly young age. His uncle, Dr. Gary Dillard, was a professor in botany (the study of plants) at Western Kentucky University, and he remembers visiting the lab when he was in 5th or 6th grade. That visit to the lab was probably the first time that he said he actually thought about being a scientist that worked on plants. Carl said it was later discovered that a fungus in the soil causes the disease. Carl went to college at Southern Illinois University (SIU) to earn a degree in Plant and Soil Science. His initial plan was to get a bachelor’s degree and then go to work in the ag industry as a sales rep. After some summer research internships with the SIU soybean breeding program and an agricultural chemical company, he found that he really enjoyed research. After receiving a B.S. from SIU, Carl went on to graduate school in plant pathology at the University of Illinois. Since receiving his doctorate, he has worked as an Extension plant pathologist at North Dakota University, then went to work for eight years at the University of Illinois, and then came to Kentucky, specifically the University of Kentucky Research and Education Center in Princeton, in July 2015. When asked what he enjoys most about his job, he said really likes that he gets to actually “farm” with his field research plots. Carl also said that he would not have done anything differently with regard to his education and work experience. His advice to young people is to seek out internship and summer job opportunities in agriculture. Learn more about what Dr. Bradley does daily by following him at @corndiseases on Twitter. The appearance of Southern Rust, a fungal disease of corn, had him really hopping this summer.